PHOTOS: Victoria Justice Is A Beauty In Black At 2015 MusiCares Person Of The Year Gala! Victoria Justice, who stars in MTV’s new series Eye Candy, looked absolutely beautiful in a black two piece dress that showed off her midriff. Not only did she looked stunning but her look contrasted perfectly with the red carpet upon her arrival at the 2015 MusiCares Person Of The Year Gala held Friday night (February 6) at the Los Angeles Convention Center in Los Angeles, California. Victoria Justice Plays Celebrity Eye Candy On ‘The Meredith Vieira Show’ – Watch Here! Victoria Justice, who stars in MTV’s upcoming series Eye Candy, visited Meredith Vieira on her show, The Meredith Vieira Show on Thursday (January 29). During her appearance, Victoria played a game of Celebrity Eye Candy where both she and Meredith had to guess which set of eyes match with the celebrity hunk in the choices. Let’s just say that there sure is a lot of “eye candy” out there! Be sure to check out Victoria playing the game and see how she guessed by watching the video below! Victoria Justice On “LIVE With Kelly And Michael” — Watch Here! Victoria Justice was a guest on “LIVE with Kelly and Michael” today, January 9th. While chatting on the show she was asked about a giant christmas sweater she and her family wore over the holidays. Family includes her dogs. The photo is the ultimate christmas card photo! Listen below while Victoria explains the story behind the sweater. Tune Into ‘LIVE With Kelly & Michael’ This Friday As Victoria Justice Appears! Make sure you guys tune into LIVE With Kelly & Michael this Friday, January 9th! Victoria Justice will be appearing as a guest, speaking about MTV’s newest series, Eye Candy! Can you wait? We sure can’t! Victoria Justice Is On The Cover Of ‘Seventeen’ Magazine’s February 2015 Issue! – See It Here! Be sure to check out more from her interview with the magazine by clicking here. Victoria Justice has been working super hard on her new original MTV series Eye Candy. The show follows a young lady by the name of Lindy who is convinced by her roommate to try online dating. When she tries, Lindy begins to suspect that one of the guys she is talking to is a killer. Teaming up with the cyber unit and some hacker friends, Lindy tries solve the murders. Be sure to check out the official trailer for the new series by watching the video below! Eye Candy premieres on Monday, January 12, 2015 at 10PM on MTV! 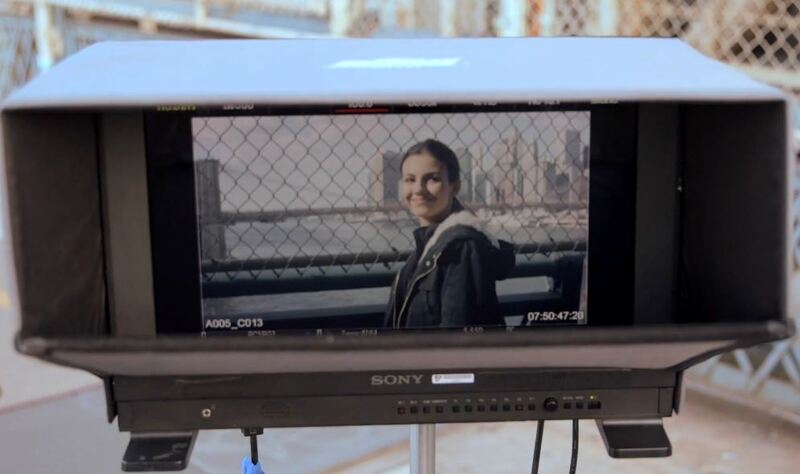 Victoria Justice Takes Us Behind The Scenes On Set Of MTV’s ‘Eye Candy’ – Watch Here! Victoria Justice is working hard on her new series on MTV called Eye Candy. We already got to see a teaser for the upcoming show and it looks so good! The show is set in New York City and is about a woman, Lindy, who suspects that one of her online dates is a serial killer. With a while until the premiere, Victoria takes us behind the scenes with her while she is on set filming. Be sure to check it out by watching the video below! Eye Candy is set to premiere in January 2015.